Anupam Shobhakar, is an Indian musician, composer, instrumentalist, record producer, and classically trained sarodist currently living in Brooklyn, New York. He has released three World Fusion albums, and one classical Indian music album. He has performed live around the world at various venues and for charitable causes. Shobhakar's track "Water" made it to the first round of the Grammy Awards.Shobhakar met Ustad Aashish Khan briefly when he came to do a concert in Bombay and stayed at Shobhakar's apartment. Shobhakar states that he was "blown away by Khan's command over the Sarode," and has been studying with him ever since. Shobhakar lists Khan, and his father, Ustad Allaudin Khan (guru to Ravi Shankar and Ali Akbar Khan), as his main playing style influences: "Slightly aggressive in approach, but never at the cost of the melodic charm." Shobhakar was recognized for his talents as an Indian Classical Music performer by the Priyadarshni Academy, who awarded him the Best Young Artist Award. Shobhakar's current focus is World Fusion and Jazz Fusion. 2004Shobhakar recorded his first album "Mysterious Awakening," in 2004. He handled every aspect of production on the record, including tracking the guitars with a "goose neck internet chat mic." Shobhakar describes the sound of the music on the album as "the best of both worlds." He explains, "Most Indian musicians do not understand harmony as it's not a part of the musical system — it's a melodic and rhythmic tradition — whereas a lot of western music is based on harmony. The album was released by Saregama HMV.2005Anupam Shobhakar says, "Apart from being a traditional concert sarod­ist, I want to really explore world music, and I've been wanting to do that for a while. I've been pretty much producing on my own: making all the music, adding all the MIDI instrumentation in my studio at home. But here it's better, because I can meet a lot of different musicians, a lot of different, diverse people." Shobhakar released a subsequent World Fusion album, "Wine of the Mystic" in 20052009In 2009, Times Music released Anupam Shobhakar's Indian Classical album, "Dream Theory." 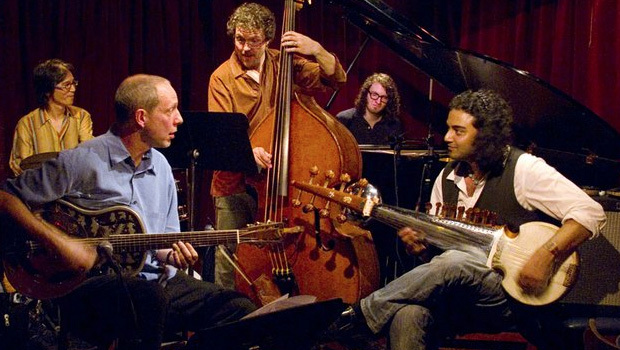 PresentShobhakar is currently working on a new project, "The Joel Harrison - Anupam Shobhakar Quintet" with noted New York jazz guitarist Joel Harrison along with Dan Weiss (Drums/Tabla), Hans Glawaschnig (Bass), Gary Versace (Keyboards). Drummer/ Percussionist for WAHH! World Fusion Band Heather DeRigo is CoFounder and Assistant Director of Shruti A.I.M. Born into a musical family, where both her parents, as well as many other family members were professional, touring musicians, Heather naturally took to the world of music. She has performed with many leading musicians in various genres of Music and also has performed in India with various Indian Fusion Bands. She was selected to perform at the prestigious Coke Studio with Ash King under the Musical Direction of world renowned Drummer, Ranjit Barot. I would Like to invite you for this event on December 6th by the amazing musicians from across the globe. 'Musical Moments' Featuring WAHH! WORLD FUSION BAND with Master Musicians from India. ‘Musical Moments’ is a powerhouse concert of some of the best Indian Musicians performing a wide array of Indian Music styles. Tampa Bay’s own rising stars of ‘East Meets West’ Music -Wahh! World Fusion Band who is fronted by the internationally respected Tabla Artist Shankh Lahiri, is rooted in India’s rich traditional musical culture and enveloped in an artful weave of Jazz, Rock and Funk. “Wahh!’ in India, is a popular word that means ‘Wow”. Trailblazers of a unique and multi-form sound, Wahh! World Fusion Band features Shankh Lahiri on Tabla and Vocals, Rajib Karmakar on Sitar, Peter Mongaya on Guitar, Ray Villadonga on Bass and Michael Washington on Drums and Percussion. They will be joined by the prestigious and award-winning Prattyush Banerjee on Sarod- (an ancient and evocative Indian string instrument), the popular Jolly Mukherjee, an Indian singer/songwriter/producer, known as India's "King of Strings" who specializes in the music of Bollywood and talented brothers Deb and Jyoti Sankar Roy of the well-known duo ‘The Violin Brothers’ who have performed under the direction of such great musical maestros as Pt. Ravi Shankar and Ustad Amjad Ali Khan and performed for Mr. Zubin Mehta, the then Conductor of New York Philharmonic Orchestra. The inspiration behind the The Shruti Foundation concept blossomed from the Shruti School of Music in Mumbai, a non-profit organization and family run school by Shankh and his sister and brother - (both highly respected musicians in the Indian Classical field of Music). Shankh has held a key role as a Founding Member and Director from its very inception.